ChargeIt by Jay Silver Hammered Round Melamine Charger Plate 13"
Home > Products > ChargeIt by Jay Silver Hammered Round Melamine Charger Plate 13"
A stunning addition to the table, the versatile ChargeIt by Jay Silver Hammered Round Melamine Charger Plate 13" is perfect for relaxed dining, festive entertaining, or high-end affairs. 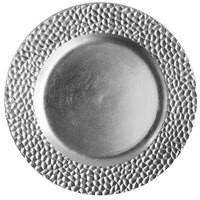 Designed with a unique hammered rim, this lustrous silver charger provides a lovely backdrop for dinner plates, platters, and bowls. Perfectly sized for multi-course meals, this charger accommodates any standard size plate, making it ideal for wedding receptions, engagement dinners, and intimate restaurants. Made from premium quality melamine, this lightweight, exceptionally durable charger plate provides the look of china at a faction of the cost. To keep this charger plate in excellent condition for a long period, hand washing is highly recommended.